This guitar was discontinued in 2012. This page has been left for comparative purposes. 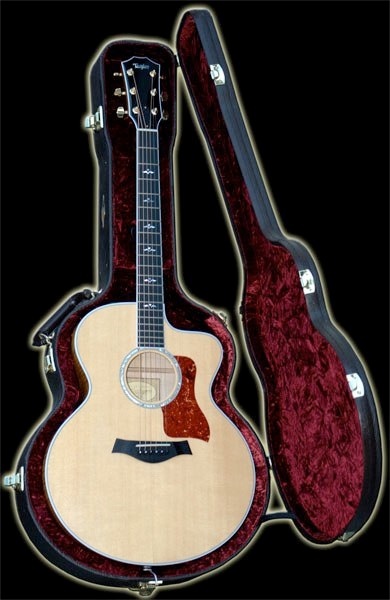 Included in price: Free Taylor fitted archtop hardshell case. Free shipping USA & Canada. The 600 series are visually and sonically stunning. 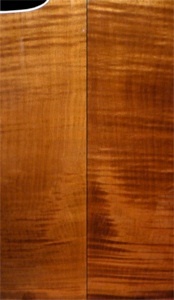 The big leaf maple on the back and sides is quite striking. The bright focused tone of the body shape and woods makes this guitar perfect for performing, recording, and any band setting. Listen to the demo below and you will hear how this guitar sits nicely in a mix without any eq’ing. Other signature touches include a crisp white binding and a leaf inlay motif. 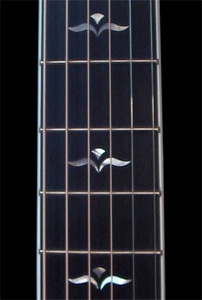 Another inherited body style that evolved in Bob Taylor’s hands, the Jumbo is Taylor’s biggest shape, and conjures a big, full sound without being bottom-heavy. While the Jumbo’s voluptuous curves present a lot of soundboard realestate, the contoured waist helps tighten the midrange, controlling the overtones.